I'll be performing live on my experimental No Input Software system this Sunday, 13 February at a special Valentine's Day gig. Headlining will be Campbell Kneale from New Zealand, best known for his work as Birchville Cat Motel, but now producing sounds as Our Love Will Destroy The World -- appropriate enough given the occasion! 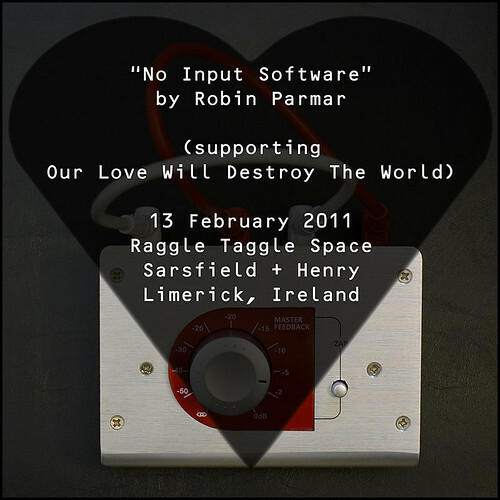 Damien Mullane has organised this "night of Music, Art, Partying and Apocalyptic Love" at Raggle Taggle Space (corner of Sarsfield + Henry) in Limerick, Ireland. Doors at 9pm. Admission 7 Euro (5 for students with ID). BYOB. More info at the Facebook page. The "no input" mixing desk is a sound mixer with outputs wired to inputs, thus creating feedback loops of various permutations and sonic characteristics. Recently I have been recreating this type of cybernetic system in software, in order to challenge certain myths of digital representation. The pieces are improvised live with no overdubs. The origins of these techniques can be traced back to 1948 and Louis Barron, who, directly inspired by Norbert Wiener's Cybernetics, built feedback circuits that literally burnt themselves up. By 1972 David Tudor was utilising acoustic feedback between transducers in "Untitled". I believe there's still a lot of sonic space to explore in this realm. My use of Reaktor to reconfigure a modality most associated with electronics is somewhat ironic. Of course we all expect audio software to produce sounds, so it is hardly a trick to do so! However my instruments are built to model the analogue equivalents closely, with no use of synthesis as such, no samples and no audio inputs. Two examples of what this might sound like are available on my Listen page through SoundCloud. Check out "Bone-Seeker" and "The Department Of Fallout". The results are chaotic and only partially predictable, so who knows what will happen on the night. I invite you all to this rare live performance. Just confirmed: I am on at 9:30pm and times will be sharp as the venue must close at midnight. Got in a good few hours of rehearsal today. Am glad I get to work in stereo since I've got a few wicked delay combos to play with!